Famed for its convict past and its wildness heritage, the island state of Tasmania is a gem in Australia’s crown and a must-visit destination for the intrepid traveller. Tasmania’s pristine wilderness and its endangered Tasmanian devil have brought worldwide attention to this small island state of Australia. First settled as a penal colony, it is now better known as a world-class tourist destination, offering adventure, art and culture at a relaxed pace. Totally unique, it has a growing reputation for locally sourced ingredients and internationally renowned restaurants, which is perfectly paired with its boutique wine industry. Within minutes you can travel from the centre of the capital, Hobart and be on a deserted beach, the top of a rugged mountain or on your way to explore its rich colonial history. With a cool temperate climate and four distinct seasons, Tasmania is not all beaches and barbeques, but scratch the surface and the island reveals its hidden charms. Almost 20 per cent of the state has been given UNESCO World Heritage wilderness protection. The flora and fauna are unlike anywhere else on earth – it’s a world all unto its own. However, the launch of MONA (Museum of Old and New Art) has seen the tourist market shift up a gear; there’s been a flurry of hotel openings and remote wilderness lodges designed with luxury travel in mind. A flying visit of a few days is barely enough, so book a week or more to discover the hidden gems of Tasmania. The Islington was a game-changer for accommodation in Tasmania when it first debuted. Built in the Regency style, it combines old-world charm with contemporary design and is bestowed with an eclectic collection of ancient and modern art throughout the corridors and rooms. It’s a destination in its own right. Situated in a leafy suburb just five minutes from the centre of Hobart and at the foot of Mount Wellington, its expansive landscaped gardens offer commanding views of the mountain and its spectacular ever-changing views. Classic rooms in the main building offer a glimpse of a bygone age, whilst the modern renovations and extensions fuse new and old as one. Guest rooms are sumptuously furnished and reflect a rich Tasmanian history coupled with contemporary elements like underfloor heating and in-room iPads with complimentary Wi-Fi. King-sized Islington Angel beds were made exclusively to the hotel’s specifications and all rooms are supplied with Aesop amenities and complimentary mini bar. Attention to detail sets the tone for personalised, understated service at the Islington. Seasonal, local and organic ingredients take precedence in the restaurant where menus change regularly to emphasise the best that Tasmania has to offer. The open-plan kitchen makes for an informal and relaxed atmosphere offering dining options at any time of the day. Not to be overshadowed, the cellar is said to hold the widest range of cellar release Tasmanian Pinot Noir on any wine list in the state. One of Tasmania’s most awarded accommodations, the Islington offers discretion, an exclusive location and contemporary touches to ensure its guests a memorable stay. On the remote northeastern coast of Tasmania, the Bay of Fires Lodge is situated in one of the most pristine locations on the island. Set on a hilltop, 40 metres above the Tasman Sea and surrounded by national park, there’s nothing but uninterrupted views of deserted beaches and outstanding coastal wilderness to enjoy. The eco-award-winning building comprises two timber and glass pavilions, which allow maximum connection to the landscape with minimum impact on the environment. And it’s a welcome sight for guests as it’s the culmination of an iconic four-day/three-night walk through the Bay of Fires Conservation Area. There’s no limousine chauffeur service here. You walk with a backpack along white sandy beaches and through the edges of coastal wilderness, getting back to nature in the most serene way. The journey allows guests to experience some of Australia’s most distinctive flora and fauna in what’s arguably one of the most picturesque places on earth. The only building on 20 kilometres of outstanding coastal wilderness, the building is at one with its setting and is eco-friendly through and through. All building materials – Tasmanian hardwood and plantation pine – were airlifted by helicopter or hand-carried to the site. Solar power provides the lighting; while hot showers and comfortable twin or double share king-sized hotel beds add a touch of luxury at the end of each day’s activities. Its large timber deck and open fire provide plenty of space to enjoy delicious meals prepared with the freshest local produce, accompanied by fine Tasmanian wines. 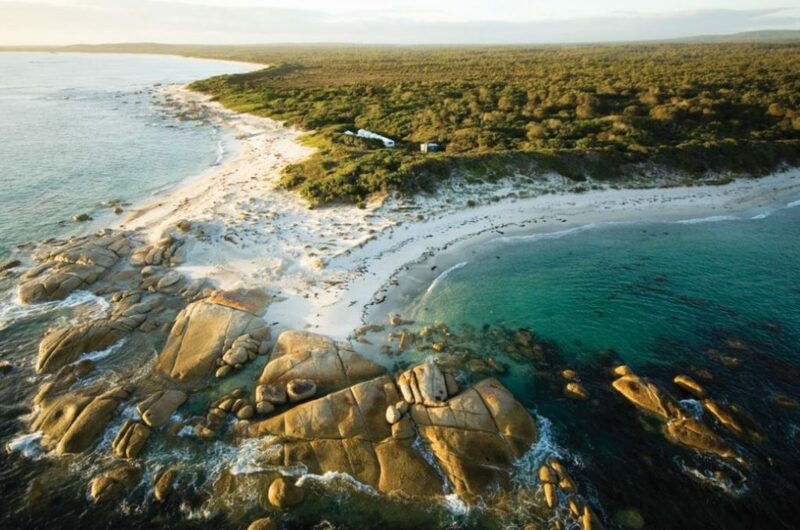 Combining eco with luxury design, Bay of Fires Lodge has built an international reputation for luxury escapes. And for the weary walker, the property has a spa. Located adjacent to the lodge, it offers breathtaking views with an outdoor deck and inside lounging spaces, extensive wellness and wilderness library and treatments from indigenous spa brand, Li’tya. Massage is naturally the most popular treatment on the menu as is the private bathing pavilion, designed to allow guests to fully submerge in nature overlooking the Bay of Fires. Overlooking the windswept beaches of northeastern Tasmania, Barnbougle is a golf-lovers dream. Combining an 18-hole golf course, accommodation, clubhouse, pro shop, bars, spa and conference facilities, it offers international standard golfing in a stunning location. And right next door is Barnbougle Lost Farm, a 20-hole links golf course. Playable in one round, the course tracks the coast and inland amongst sand dunes and is significantly steeper than its neighbour. Wide open fairways make way to sand dunes and sea; it’s an impressive setting, which draws international golfers and holidaymakers alike. Accommodation at Barnbougle is designed for friends, families and couples. Four bedroom villas and two bedroom apartments make for casual, relaxed living and are spread around the course with views across the dunes and out across Bass Strait. At Barnbougle Lost Farm, the 50-room lodge is perched atop a coastal dune overlooking the course, the rugged hinterland of northern Tasmania and beautiful coastline of Barnbougle Beach. The main attraction here has to be the restaurant and lounge area, which is encased by glass windows, protecting diners from the elements whilst taking in the mesmerising views of the course and coastline. Making the most of locally sourced Tasmanian ingredients, it’s a highlight of the stay. And for those not so golfing-mad, there’s always the spa. Using Sodashi products, The Spa at Lost Farm is a boutique health and wellness facility with both single and couples’ treatment rooms, vitality pool, steam retreat, relaxation room and naturopathy clinic. Offering the usual spa treatments and some inspired by the natural bush ingredients of Tasmania including wattle seed, what’s interesting is the option of hypnobirthing, a technique for achieving a satisfying, relaxing and stress-free method of child birth. MONA Pavilions, on the outskirts of Tasmania’s capital, Hobart, provides guests with the chance to fully immerse themselves in modern art in an ultra-contemporary setting. MONA, the Museum of Old and New Art, is Australia’s largest private museum and the brainchild of MONA Pavilions’ owner David Walsh. Adjacent the internationally renowned MONA, Museum of Old and New Art (Australia’s largest private museum), the eight MONA pavilions overlook the Derwent River and feature artwork from the MONA collection. Four pavilions are named after 20th-century architects who significantly influenced Australia’s architectural landscape, and four pavilions are named after 20th-century Australian painters: Charles Blackman, Brett Whiteley, Sidney Nolan and Arthur Boyd. 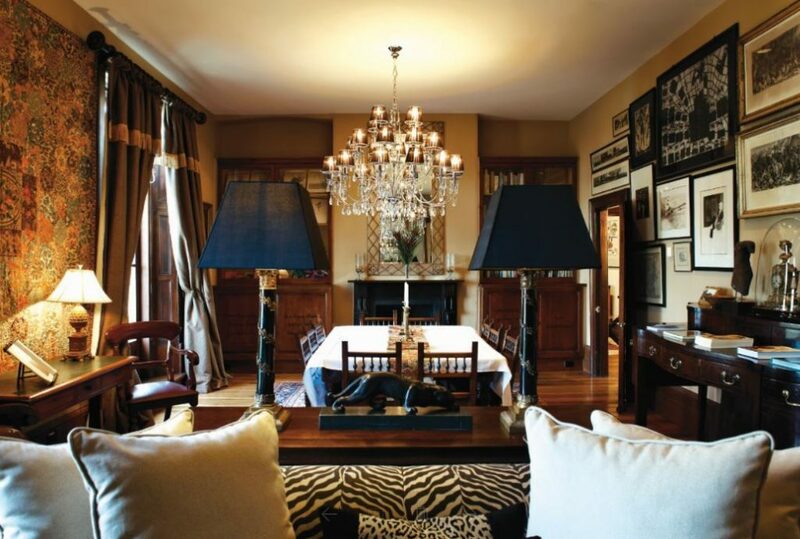 Art adorns the walls and living spaces in each bolt hole with Charles, Arthur, Sidney and Brett each boasting an original painting by its namesake, as well as antiquities and a collection of ancient coins. Designed in 2008 by Nonda Katsalidis, in association with the Antarctica Group, the pavilions are inspired by shipping container shapes and the A-frame homes of the 1960s. A mixture of one- and two-bedroom accommodation, each pavilion has a kitchen, laundry, wine fridge, wireless touch panels (climate, lighting, info and entertainment), Wi-Fi and personal security camera, plus chic furniture by designers such as Tom Dixon and Philippe Starck. On-site there’s a gym, sauna and heated infinity pool. The most impressive choice at MONA is Roy, a three-storey Sphinx-like building built from glass and steel, which features bespoke furniture from Tasmanian designers, a large living space, two bedrooms and an outdoor spa bath. Nestled amongst the Eucalypt trees, the rest of the pavilions are split between traditional A-frame buildings and cube-like modernist designs combining art and architecture, which really have the wow factor. Modern, luxurious with a cutting-edge design, MONA Pavilions is an art unto itself. 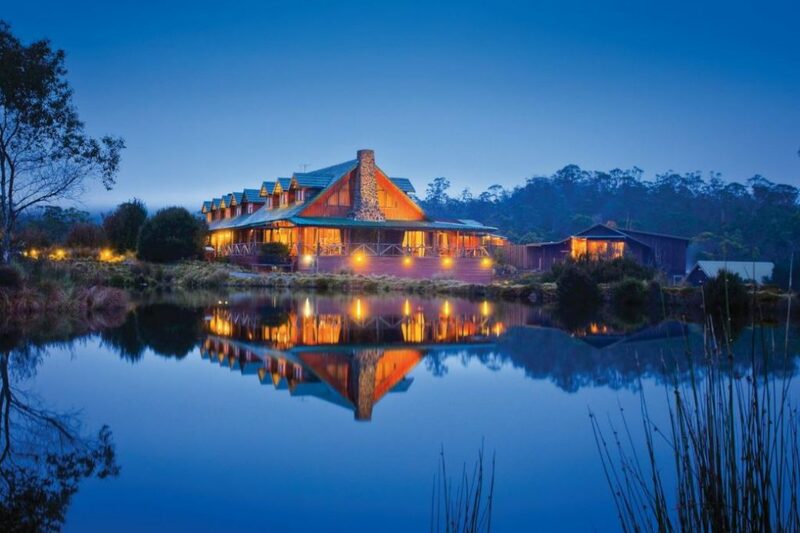 In the beautiful alpine mountains, Peppers Cradle Mountain Lodge creates a haven for bush walking and nature spotting to escape for a few days’ peace and tranquillity. Located on the edge of the World Heritage-listed Cradle Mountain-Lake St Clair National Park, the majestic Cradle Mountain is the main attraction and can be viewed from Dove Lake or one of the many walks varying in difficulty and gradients. From a short stroll to the five-day overland track, there’s something for everyone. Many of the walks begin within the lodge complex and take in magical bush land, alpine settings, streams and waterfalls. Staying at Cradle Mountain Lodge is a treat; the cabins are well appointed with modern conveniences, but it’s the log fires that ensure they retain a truly rustic charm. These wooden cottages nestled amongst the bush connect guests with nature, where you can spot possums, wallabies and wombats wandering free right outside the cabins. It’s also possible to stay in the main lodge in hotel-style rooms, but your best bet is booking into a cabin. Top notch food in the restaurant includes seared wallaby and a host of local produce, or there’s the more relaxed bar and cafe. There’s a grocery and souvenir store in site to pick up essentials and the main national park office also has a range of goods available, with advice and tips on local walks. Here at the central office, tours include canyoning, helicopter flights over the national park and wildlife spotting tours after dark. 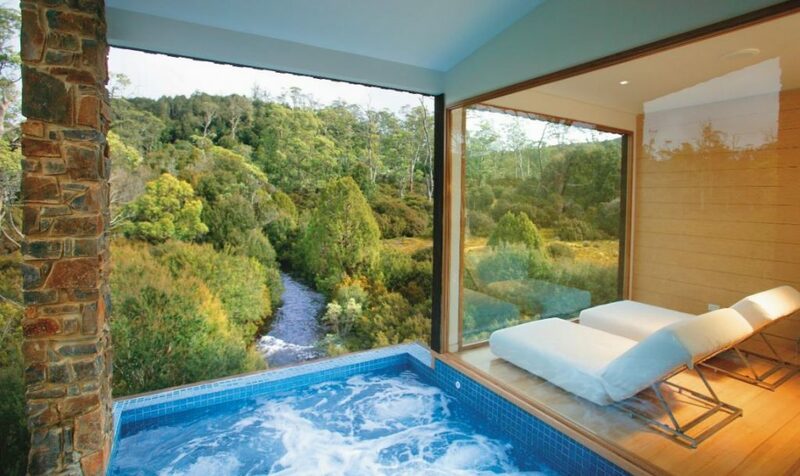 One of the top draws at Cradle Mountain Lodge is the Waldheim Alpine Spa. But a treatment alone is not enough; to get the full experience, book some private time in The Sanctuary, a dedicated therapeutic lounge with steam room, sauna, large hot-tub and cool plunge pool and relaxation beds that look across the wilderness. Relaxing in the outdoor pool breathing in the fresh mountain air is a memory to last a lifetime. 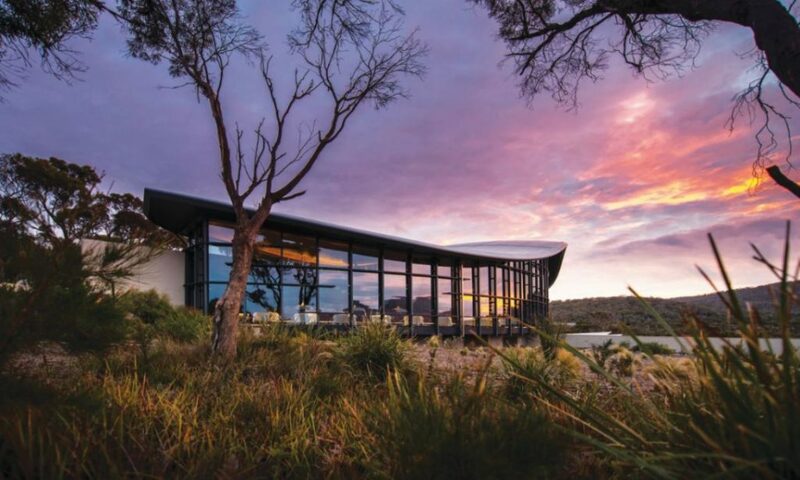 Saffire Freycinet has raised the bar for luxury accommodation in Tasmania. The fully inclusive resort creates a relaxed air of exclusivity for guests with just 20 suites on site. Architecturally impressive, the main building has been crafted in the shape of a stingray and is the first welcome for guests. The concierge greets all guests on arrival to valet park the car, swapping car keys for a glass of champagne, whilst inviting you to enjoy the view. And what a view it is – of the Hazards, Coles Bay and Freycinet National Park. A luxury escape like no other – each suite has uninterrupted views of the bush, sea and Hazards. Everything is designed with the view in mind. Contemporary suites feature every mod con and more, including a fully stocked complimentary mini-bar, which showcases Tasmania’s best wine, beers and snacks. Dining is a joy, breakfast is an à la carte affair with changing menu each day, lunch is informal with salads and barbecue fish or meat, but the evening meal is the main event. With locally sourced ingredients, degustation menus and arguably some of the most exceptional dining experiences in Australia, it really is a joy and pleasure. The spa offers options to chill out and relax, and all guests receive a voucher for a 40-minute treatment as part of the stay. Spa aficionados always upgrade to a longer body therapy or a high tech anti-ageing facial. For more adventure, join one of the inclusive tours like kayaking, bush walking, meeting the Tasmania Devils in the on-site sanctuary. The crème de la crème is the Oyster Farm tour. Informative and iconic, it concludes with an oyster tasting session in the middle of the oyster farm, knee-deep in water, sipping local sparkling wine. Renowned for its intuitive service and personalised touch, Saffire Freycinet is one of Australia’s shining stars in the luxury market. Pumphouse Point is the latest hotel offering in Tasmania that’s creating a real buzz. Situated in the middle of Lake St Clair, the building originally functioned as a pumphouse for enormous water turbines, which served the local hydro-electricity scheme. Abandoned for many years, this historic industrial site has been restored to offer boutique accommodation in the heart of Tasmania’s Wilderness World Heritage Area. It’s a surreal and serene setting in some of the most dramatic natural landscape in the world. 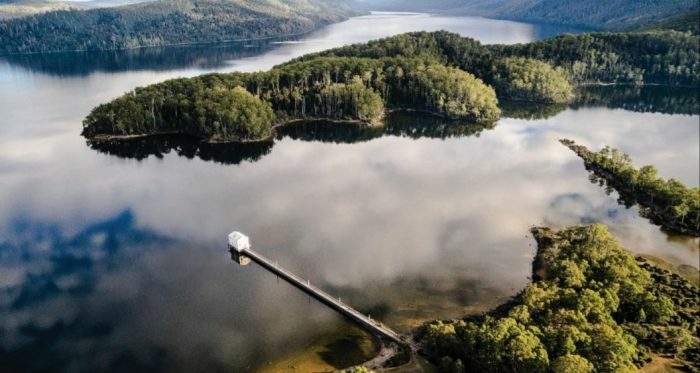 Pumphouse Point combines exclusivity by way of its size and location, and the opportunity to experience the natural beauty of the wilderness in the comfort of modern and refined surroundings. Casting an almost ghostly figure on the water, the pumphouse building is 250 metres out on the lake accessible only by a walkway, which offers a totally unique stay. A small library, lounge and bar ensure that relaxation and reflection take maximum priority where guests can really get away from it all. Each room is equipped with a larder comprising a range of picnic and platter food and local beverages making dining as informal as guests choose. A hearty highland breakfast is included in the nightly rate, and in the evening, guests can dine quietly in the seclusion of their room, or for a more social evening meal, dine in the Shorehouse for impressive shared platters and cooked meals. To make the most of the unique location, guests can explore the wilderness with bush walking trails from the doorstep, drift boats, or a spot of fishing. For a faster pace there are bikes, or you can take to the skies in a seaplane to view the Gordon River and the wider Cradle Mountain-Lake St Clair National Park. And not forgetting that Pumphouse Point is home to a community of furry friends: wallabies, echidnas, native quolls, possums, wombats, the famous Tasmanian devil and a wide variety of birdlife.